Parking and reversing make up almost one in ten serious van accidents, according to new figures released by the Department for Transport (DfT). In 2016, some 1,350 parking and reversing van accidents involving light commercial vehicles weighing up to 3.5 tonnes resulted in a death or injury, the DfT says. 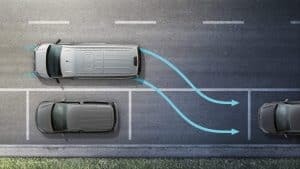 Additionally, far more parking and reversing incidents occur which do not have a direct human impact but will inevitably affect fleet and business operations. On top of personal injury, these accidents can often put vans out of action for some time, with the unavoidable downtime for repairs costing fleets an average of £550 a day per van. And that’s before the repair bill to the vehicle itself, which averages at £1,678. Parking cameras and sensors can reduce the chances or severity of accidents and telematics can offer insights into where drivers went wrong. A spokeswoman for Volkswagen Commercial Vehicles – which offers driver assistance systems across its range of Caddy, Transporter and Crafter vans – said: “The figures show how problematic parking and reversing can be for commercial vehicle drivers, especially for those who spend a lot of time negotiating tight spaces.